Pippa Greenwood, BBC Gardeners’ Question Time panellist and BBC Gardeners’ World columnist, will be visiting Palmers Garden Centre in Leicester on Thursday 14 March between 11am and 2.30pm. Pippa Greenwood, the popular gardening broadcaster and writer, has teamed up with Stewart Garden, the market leader in quality garden products, to take a tour around eight garden centres in England, the second of which is Palmers Garden Centre on Thursday 14 March. The tour is part of Stewart Garden’s partnership with Pippa, which commenced in 2011, and follows the successful series of visits to centres across the country earlier in 2012, encouraging people to grow their own produce. Throughout the tour, Pippa Greenwood explains the principles of grow your own and give practical demonstrations of potting, creating growing beds and propagation. Comprehensive information sheets written by Pippa and complementing the demonstrations will also be available to visitors. Over a hundred years old, Palmers Garden Centre is still a family run business, now in the hands of the fouth generation of the Palmers family. Well established as a highly reputable garden centre in Leicester, Stewart Garden saw it as a wonderful location for the Pippa Greenwood tour this year. While at Palmers Garden Centre, Pippa will take a tour of the garden centre where she will be talking with the staff and customers, answering their questions. Visitors are encouraged to email questions in to Palmers Garden Centre ahead of Pippa’s visit. Motivated by increasing food prices, more and more people are opting to grow their own fruit and vegetables. The trend shows no sign of slowing down. Even people who don’t have gardens can enjoy the benefits of grow your own: an impressive range can be grown on a balcony or a small back yard. Visitors wishing to attend Stewart Garden Grow Your Own Tour with Pippa Greenwood should contact the garden centres direct. More information about the tour will appear on Pippa Greenwood’s Stewart Garden blog at www.stewart-garden.co.uk/blog. For more information about Pippa Greenwood and ‘Grow Your Own with Pippa Greenwood’, visit www.pippagreenwood.com. Pippa Greenwood trained as a botanist at Durham University (BSc hons) and then gained an MSc in Crop Protection at Reading University. In 2007, Pippa was awarded an honorary Doctorate of Science (DSc) by the University of Durham for her work in gardening and its science. In 1985 she joined the staff of the Royal Horticultural Society’s Garden at Wisley in Surrey, where she ran the Plant Pathology Department, answering several thousand queries from gardeners every year. In 1988, Pippa began working for the BBC, joining Alan Titchmarsh for the gardening slot on BBC 1’s Daytime Live. From 1989 until 2002, she was a regular presenter on BBC 2’s Gardeners’ World, presenting many items on garden pests and diseases, science and gardening, as well as creating and running her organic kitchen garden from her own Hampshire garden. Pippa is a regular panellist on BBC Radio 4’s Gardeners’ Question Time, travelling the length and breadth of the country to present the programme throughout the year. In 2000, 2001 and 2002 Pippa presented her own series, Growing Science on Radio 4. For several years Pippa hosted BBC Radio Solent’s Topsoil with Pippa Greenwood, a three-hour gardening and music show. Pippa has guested on a number of television and radio programmes including Tomorrow’s World, You and Yours, Woman’s Hour, BBC Breakfast, This Morning, GMTV, Breakaway, Grass Roots and Call my Bluff. She was a judge for the BBC Gardener of The Year competition in 2001. Pippa was the gardening consultant for the ITV murder mystery series, Rosemary and Thyme starring Pam Ferris and Felicity Kendal, advising on the gardening sub-plot and other plant related matters, and the gardening personalities of the two actresses! Pippa has several regular writing commitments including BBC Gardeners’ World Magazine, and a monthly page in ‘NFU Countryside Magazine’. For 18 years Pippa was the gardening columnist for The Mirror newspaper. Pippa writes a blog for BBC Gardeners’ World Website and has her own website, www.pippagreenwood.com. Here she writes a gardening blog and offers ‘Grow Your Own with Pippa Greenwood’ (garden ready vegetable plants plus weekly advice emails), a garden advice service called ‘Ask Pippa’, and a range of grow your own related products. Pippa has written many books including the bestsellers, New Gardener (in excess of one and a quarter million copies sold), Gardening Hints and Tips, Garden Pests and Diseases, Garden Problem Solver, Flower Gardener, Pippa’s Organic Kitchen Garden, A Garden for All Seasons, Pippa Greenwood’s Gardening Year and 1001 Ways To Be A Better Gardener. She co-authored The Gardeners’ Question Time book. Her latest book is A Gardener’s Calendar. Pippa lectures, hosts gardening tours and gives gardening-related demonstrations across the UK and abroad. Pippa lives in Hampshire where she gardens on a windswept hillside with a strongly alkaline, heavy-clay soil. 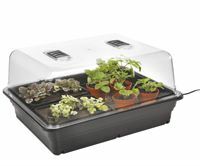 www.pippagreenwood.com offers ‘Grow Your Own with Pippa Greenwood’ and a range of grow-your-own-related products.